We can all do it – convert our kitchen and garden waste, and a lot more besides into usable compost for the garden – and there is a method to suit everyone. Worm composters, primarily developed for tiny households with mostly kitchen vegetable waste, have now been scaled up to cope with much larger loads. For the energetic there are various tumbler systems. 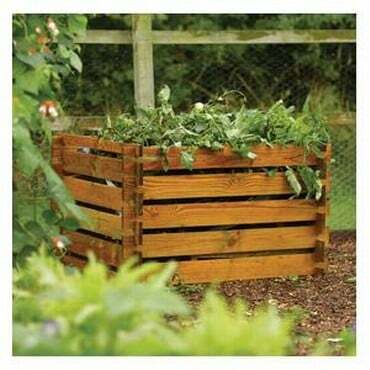 Several folk favour the aesthetically-pleasing slatted wooden bins but efficient plastic compost bins that, kept tightly shut and (most importantly) their contents stirred regularly, can produce lovely crumbly compost in only a few months. Where should they be sited in the garden? Most compost systems (with the exception of wormeries and tumbling compost bins) definitely need to be in contact with the ground. 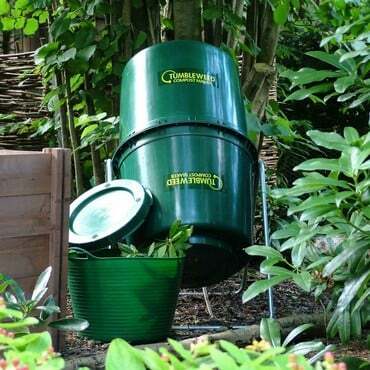 But even if you have to stand compost bins on weed-smothering membrane or expanded metal mesh (to keep out invasive tree or hedge roots and rodents respectively) you will find that beneficial earthworms, woodlice and other major players will find their way into the decaying mass. Covered wooden hoppers retain the heat well (an important part of the composting process) and can be hidden away in a dark corner if required, while plastic bins work faster if they get the benefit of sun for part of the day. What can go in to a conventional bin and how does it all work? Autumn leaves are best composted on their own in hessian bags or cages, since they rot down more slowly and in a different way. Seeding weeds or garden thugs (i.e. Verbascums, Fennel) Roots of perennial weeds such as ground elder and bindweed – unless they are thoroughly dried off in the sun first. Cat and dog (i.e. carnivore) manure. Meat or cheese kitchen scraps or vegetable waste that has been contaminated by them. Too dry? 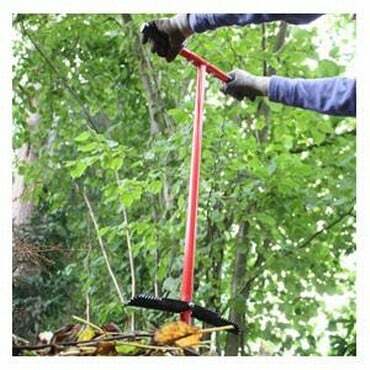 Water the heap and/or add more greenery and cover it tightly to keep the heat in. Smelly? Add more ‘brown’ ingredients, but no grass clippings or kitchen waste for a while. Stir the contents to open it up. Leave the lid off. Rats? This is a tricky one - they may try to move in if there is a regular source of food nearby (i.e. a bird table or poultry house). Slugs and snails? No problem. They are doing their bit for the composting process, and at least it keeps them away from your lettuces and hostas.